On his chin there is nohair. Add a puff so white. Each night a child adds a cotton ball to the beard and when the last one is on -it's Christmans Eve. 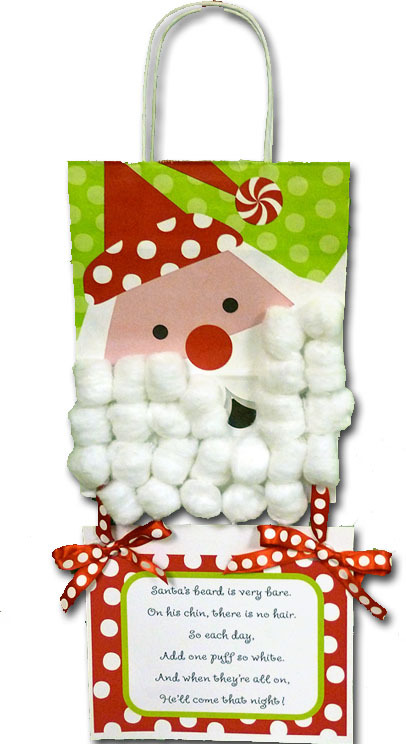 This one uses a printed Christmas Shopping Bag from NashvilleWraps.com but you could use any Santa picture that would have a beard large enough to hold 25 cotton balls. The step-by-step instructions are printed here along with a free downloadable file for the poem art. http://www.holidayribbon.net/ I would use a glue stick to keep from getting little fingers - not too mention your floors - sticky. 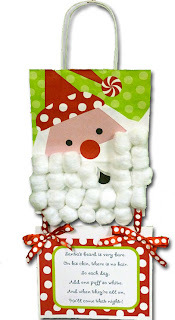 All you need is your Santa Picture, Glue stick, 25 cotton balls, ribbons and the free downloadable file from the web site. Have fun but hurry - Christmas is coming soon!